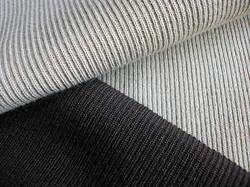 We are a leading Manufacturer of plain woolen knitted fabrics, striped woolen knitted fabrics, fancy woolen knitted fabrics and woolen knitted rib fabrics from Jaipur, India. We are engaged in offering Plain Woolen Knitted Fabrics to our esteemed clients across the nation. These knitted fabric are perfect for crafting women's tops, jackets, skirts, blouses and lotto shirts. Available in various colors and patterns, these can also be customized as per the specific requirements of our valuable clients. Apart from this, our offered fabrics are stringently inspected by our skilled quality controllers to ensure flawlessness and high quality to the clients. 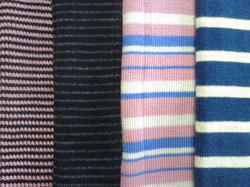 Taking pride in declaring our selves as the leading provider of Striped Woolen Knitted Fabrics. These fabrics are knitted beautifully and stripes are made on these. Our experts have fabricated these fabrics with the help of top quality cloth procured from our sourced vendors. These have ecstatic and intricate patterns and are customizable according to the likeness of the clients. These are available in large quantities with us. Likewise, these are available at cost effective prices. We make these Striped Woolen Knitted Fabrics on 12 gg computerized flatt knitting machines. For these fabrics we used 2/30 100% oswal daffodil acrylic yarn, 100% pure wool and various blend of woolen and acrylic yarns. 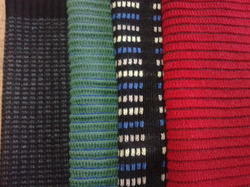 We develop various types of Strips design in the fabric. Width of these fabrics in between 26-30 inches depending on quality. These fabrics are perfect for making woolen sweaters,cardigons,woolen leggings,Jackets and other woolen products. Owing to our rich industry experience, we are able to offer our clients a collection of Fancy Woolen Knitted Fabrics. We manufacture these fabrics using high-grade threads, yarns and wool. Our customers can avail these fabrics in myriad of colors, designs, patterns and sizes in the market. We offer these fabrics at pocket-friendly prices to our most respected patrons who are based across the nationwide market. We made these Fancy Woolen Knitted Fabrics on 8gg and 12 gg computerized flatt knitting machines. For these fabrics we used 2/30 100% oswal daffodil acrylic yarn, 100% pure wool and various blend of woolen. We develop so many customized fancy designed fabrics in different knitts. These fabrics are suitable for making woolen Knitted fancy jackets ,blazers and other heavy weight garments. Width of these fabrics depends on per inch knitts and their weights that may be 25-27 inches. We are manufacturer, supplier and exporter of a wide variety of Woolen Knitted Rib Fabrics, which is the outcome of our sophisticated infrastructure. Easy to maintain, sweat absorbent, our range can be used in the manufacturing of several comfortable clothings. We offer our collection at very competitive rates. We made these Woolen Knitted Rib Fabrics on 12gg computerized flatt knitting machines. Rib Fabrics can be made in light ,medium,heavy weights depending on client's requirements. Light and medium weight fabrics can be used as accessories like gripping in the bottom,gripping on sleeves and neck of the garments. Heavy weight Rib Fabric can be used in making woolen knitted jackets and coats.